Five of 14 neighborhood-park sites that the city began buying up years ago are finally scheduled to begin construction this year. 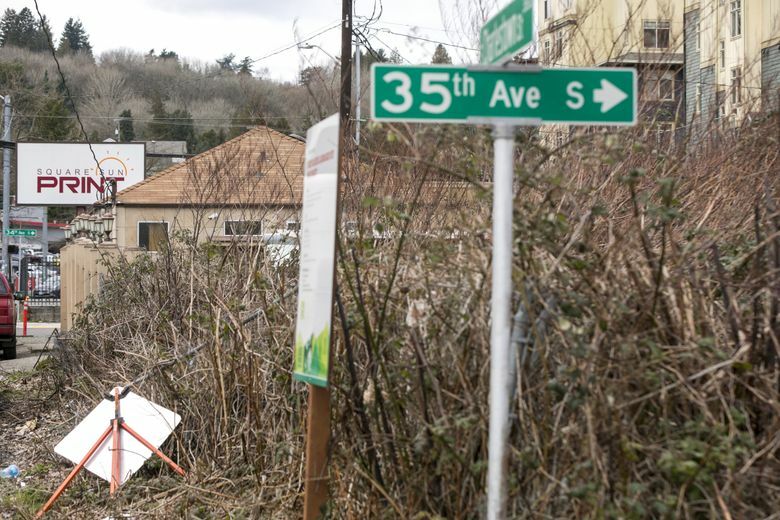 The City Council voted Monday to authorize Seattle Parks and Recreation to acquire a small Rainier Valley property — by eminent domain, if necessary — and make it part of a new park, one of more than a dozen planned for neighborhoods across the city. For years, the city has been intending to build a park where it already owns five properties, just east of Rainier Avenue South and north of Rainier Square Plaza. Adding the sixth property, at the corner of South Charlestown Street and 34th Avenue South, will allow the green space to cover an uninterrupted 1.4 acres. The property now is occupied by a small building, where there are plans for a sandwich shop to open soon. The Rainier Valley properties comprise one of 14 sites where the city began buying and banking land many years ago with money from the 2008 Parks Levy. When the initial purchases were made, there was no money to actually construct the neighborhood parks. But the Seattle Park District, a permanent taxing authority that voters approved in 2014, recently has been allocating funds to design and build them. 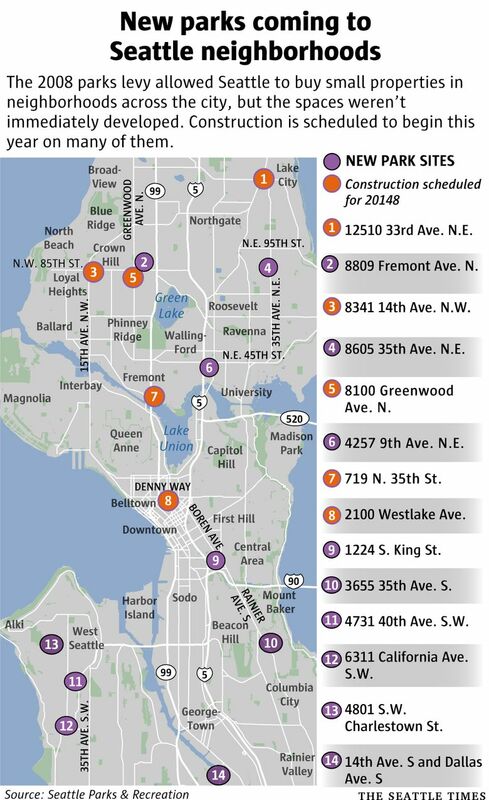 Construction is now scheduled to begin this year at five of the 14 new parks — in Denny Triangle, Lake City, Fremont, Greenwood and Crown Hill — and for several others in 2019, according to Parks and Recreation. Before they set out to acquire the new sites all those years ago, Parks and Recreation officials looked for green-space gaps in the “urban centers” and “urban villages,” where the city was encouraging dense development. “This work was really teed up with neighborhood planning done in the late 1990s,” said Michael Shiosaki, director of planning and development for Parks and Recreation. The Rainier Valley site, a half block off Rainier Avenue South, is a good example of how the new parks are supposed to support recent development. SouthEast Effective Development has built several apartment complexes within blocks of the site, totaling hundreds of units for low-income and senior households. “You can see the density of housing coming to that neighborhood,” Shiosaki said. At public meetings this past year, neighbors expressed support for the new park to be built with fitness and play equipment, plantings, picnic areas and barbecue areas. The ordinance approved by the council Monday in a 7-0 vote will allow Parks and Recreation to acquire 3656 34th Ave. South by eminent domain, if need be. The city initially sought to buy the site in 2010 and was outbid, according to council documents, and the existing owner in October filed a plan to subdivide the property. “We do not want to talk about the price, as this would interfere with the negotiations with the property owner,” said Christina Hirsch, Parks and Recreation spokeswoman. The property is now occupied by a building that was once a print store, and Aaron Tran Hunyh is working to open a Vietnamese sandwich shop there, he said Monday. Tran Hunyh, who said he is renting the space on a three-year contract, had been told apartments eventually would be built on the property and hadn’t been told about the city’s takeover plan, he said, expressing concern that the park will displace his business. “I don’t think the owner is going to be happy about it,” Tran Hunyh added. Efforts to reach the property’s owner weren’t immediately successful Monday. No one appeared before the council to comment publicly on the ordinance. Seattle Times photographer Bettina Hansen contributed reporting.